VietNamNet Bridge – Bui Van Mien was sentenced to four years of imprisonment on Wednesday for wildlife trafficking, reported the Vietnam News Agency. Mien is a resident of Xuan Phong Commune, Kim Boi District, in the northern mountainous province of Hoa Binh. On January 2, 2018, Kim Boi District police inspected a car, numbered 28A-00427, and arrested Mien. 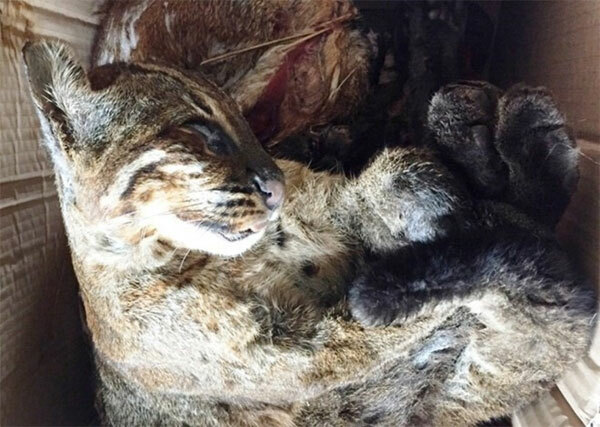 They seized a box containing the bodies of three Asiatic golden cats. According to Mien’s testimony, the cats were from Laos, and he was hired to transport them to Hanoi. Mien was arrested soon after the 2017 Penal Code became valid, raising sentences for wildlife violations to 15 years of imprisonment or a fine of VND2 billion (US$88,000) for individuals and up to VND15 billion ($660,000) for legal entities, along with suspension of operations ranging from six months to three years or permanent closure of operations. With the new regulation in place, Mien has been charged under the provisions of Clause 2, Article 211 of the 2017 Penal Code, which lists five to 10 years in prison. However, due to some extenuating circumstances, Mien was sentenced to only four years in prison under the mentioned law. The police are currently expanding the investigation into the case to find the person who had provided the three Asiatic golden cats to Mien. The Asiatic golden cat is an endangered and rare species protected at the highest level under Vietnamese and international laws. The animal features in the list of endangered species in need of priority protection issued in 2013 in Vietnam and the Annex I of Convention on International Trade in Endangered Species of Wild Fauna and Flora.